Obama Lied. My Third Health Plan Just Died. Once was a shock. Twice was an outrage. Thrice is a nightmare that won't end. Over the past three years, my family's private, individual health insurance plan -- a high-deductible Preferred Provider Organization -- has been canceled three times. Our first death notice, from Anthem Blue Cross Blue Shield, arrived in the fall of 2013. Our second, from Rocky Mountain Health Plans, came last August. Three weeks ago, we received another ominous "notice of plan discontinuation" from Anthem informing us that the insurer "will no longer offer your current health plan in the State of Colorado." Every time we receive a cancellation letter, I recall President Obama's big lie: "If you like your doctor, you will be able to keep your doctor. Period. If you like your health care plan, you will be able to keep your health care plan. Period. No one will take it away. No matter what." Then I imagine Vincent Price's evil "Thriller" laugh reverberating at the end of that cruel punchline: Mwahahahahahaha! Like an estimated 22 million other Americans, I am a self-employed small-business owner who buys health insurance for my family directly on the individual market (as opposed to group insurance through a company or third party). Our most recent plan features a $6,000 deductible with a $1,000 monthly premium. It's nosebleed expensive, but provides us access to specialists not curtailed by bureaucratic gatekeepers. This has been important for us because several members of my family have required specialized care for chronic illnesses. Once again, however, I'll soon be talking about our plan in the past tense. Choices for families like mine have evaporated in the era of Obamacare. In Colorado, UnitedHealthCare and Humana will cease selling individual plans next year. Rocky Mountain Health Plans is pulling out of the individual market in all but one county. Nearly 100,000 of my fellow Coloradans will be forced to find new insurance alternatives as open enrollment approaches on Nov. 1, according to the Denver Business Journal. As Anthem abandons PPOs, the cost of remaining individual market plans will soar an average of 20 percent. 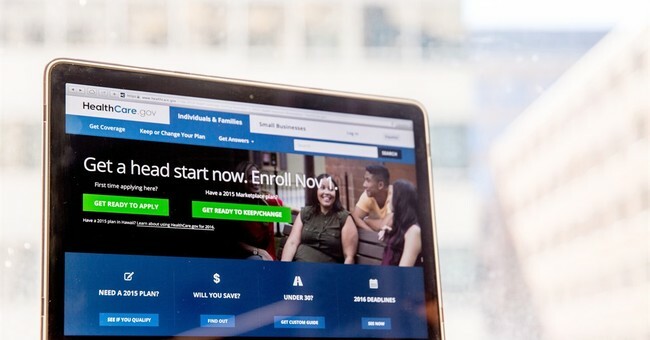 Individual market customers on the Obamacare exchange in Oklahoma learned last week that they'll face average rate hikes of a whopping 76 percent. Last month, Maryland approved double-digit rate hikes for all individual market plans. In August, Tennessee approved rate increases of between 44 and 62 percent for three insurers still carrying individual market plans. And in Minnesota, where the individual market is on the brink of collapse, state officials recently agreed to raise rates an average of 60 percent next year -- affecting an estimated 250,000 people both on and off the Obamacare exchanges. The private individual insurance market is in peril. The government-run exchanges are flailing. And the vaunted nonprofit Obamacare co-ops that were supposed to dramatically lower costs have bombed despite billions in taxpayer subsidies. I believe this insurance market meltdown -- which many of us predicted from the get-go -- is not by accident, but by design. Or as Oklahoma Insurance Commissioner John D. Doak put it: "This system has been doomed from the beginning." Smug propagandists for Obamacare, such as liberal magazine Mother Jones, continue to dismiss the plight of millions of families like mine and accuse us of concocting a "phony" crisis. But it's the architects of Obamacare who prevaricated all along. Remember: Obamacare godfather and MIT professor Jonathan Gruber bragged that "lack of transparency" was a "huge political advantage," along with what he derided as "the stupidity of the American voter." This wealth redistribution Trojan horse was sold to gullible Americans as a vehicle for expanding "affordable" access to health insurance for all. Now, millions of us are paying the price: crappier plans, fewer choices, shrinking access to specialists, skyrocketing price tags -- and no end in sight to the death spiral.